It's Friday, time for another Bloggers Challenge. This weeks challenge is a color challenge - use the following colors, Turquoise, Pink and Green Galore (my photo didn't pick up the Green Galore - but I can assure you that was the color I used) - you can add White or Vanilla if needed. I actually stuck true to the color challenge - no added black or brown! Finished size - 4-1/16" x 4-1/16"
I used my Stamp-a-Ma-Jig to get placement of my Fresh Cut stamp on the note card. 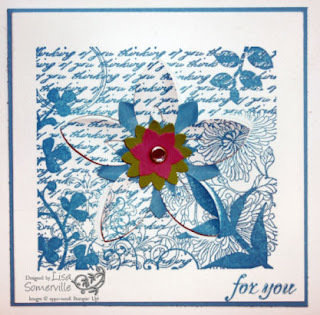 After stamping the card, I removed the white petals, curled them on my paper piercer tool from the tool kit and layered them on my Turquoise punched 5 petal flower (ends were also curled to give more dimension). Add the Green Galore and Pixie Pink punches from the 5 Petal Punch, then insert a rhinestone from the Pretties Kit and attach to flower as shown with a dimension. Stamp sentiment in Turquoise. Layer on 4-1/16" x 4-1/16" Turquoise base. If you'd like to play along with this weeks challenge - link your card to this post, or if you upload to SCS, please use BC51 as your keyword. Beautiful card Lisa. Love the touch of pink! Awesome Lisa...I just love these fresh cuts! Very pretty! Love how you left the petals intact! Beautiful! What a pretty background that stamp makes! very pretty, just a touch of green! This is stunning!! Nice job using the Fresh Notes. It's so pretty, Lisa. You know I love those brads! This is lovely! I looked at my Fresh Cuts this morning too - but decided on a different card. Yours is a BEAUTY! After seeing how many of you used this set I am SURE that I am the only demo that does not own it,lol. Great card Lisa. Beautiful Lisa! I love how you stamped over the cut out flower, and popped the petals up. Very nice. Lovely card, Lisa! I enjoy seeing all the Fresh Cuts samples! Nicely done. The hints of the pink and green galore were a surprising touch. Sublte and yet effective. The layered flower is beautiful! Well here is a techique within a Challenge..You always amaze me. The subtle use the green and pink are just the right touch for this one!! Really sweet!